Meridian Bioscience (VIVO) "A Podcast"
Click HERE for the Podcast on Meridian Bioscience (VIVO) that I recently posted on my Podomatic Website. "Happy Birthday! 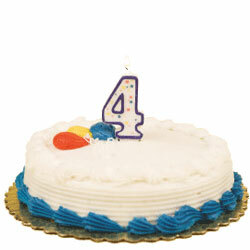 Guess Who's Four?" Hello Friends! Thanks so much for stopping by my blog, Stock Picks Bob's Advice! Somehow I missed my own birthday a few days ago. This is one I picked up today. STJ is the stock symbol. I do not as I write and publish this own any shares. Am thinking about suggesting this to my stock club. Company had a great day today with a nice move on the upside. Last Quarter was good and the past five years have been steady growth. Closed at $55.30 up $2.92. So the daily momentum helped it make the list." The rest as they say is history :). A few facts about the blog. First of all, I now have 1,485 entries, and all of them are still available by date. I also have problems finding entries on my own website, and cannot always recall whether I have written up a stock or not. In that case, I Google the stock name along with the "Stock Picks Bob's Advice" phrase to identify it. According to my Sitemeter counter, I have had a total of 126,324 visitors, who have looked at 223,879 pages of my blog. I average 176 visitors/day who view 285 pages/day. Enough statistics! I would like to use this entry to thank all of you for visiting my website, encouraging this amateur to continue in what he has been doing, and providing me with the occasional question, comment, or word of encouragement that has made all of the difference. I look forward to more entries here on Stock Picks as I strive to develop and refine my own approach to investing and managing a portfolio and invite you to all come along for the ride. I hope that we all are learning about stocks together. Be sure and have a piece of cake and some ice cream before you leave. One of the additional tasks that I try to address each weekend is to examine my actual holdings in my Trading Account. I have been going alphabetically (by symbol), looking at one of my now nineteen positions every two or three weeks. I do this as part of the transparency of the blogging that I do on this website. So that you may better understand my philosophy, my actual decision-making, and even help decide if what I do actually works, it is useful at least for me to share with you the actual holdings and trades in my account. I hope that all of you also find it useful. On April 21, 2007, I reviewed Universal Electronics (UEIC) on Stock Picks Bob's Advice. Going alphabetically (by symbol) I am now up to Meridian Bioscience (VIVO). Currently, I own 315 shares of Meridian (VIVO) that were acquired on 4/21/05 at a cost basis of $7.42/share. Meridian shares closed at $20.57 on 5/18/07, representing an unrealized gain of $13.15 or 177.2% on these shares. I have already sold portions of Meridian four times as per my portfolio management strategy, selling shares at 30, 60, 90 and 120% appreciation levels. Meridian is actually approaching the next targeted appreciation level which after a 120% target, is at 180% appreciation. Calculating this figure, the next sale would be triggered if the stock should reach a 2.80 x $7.42 = $20.78. If that is reached then I plan on selling 1/7th or 315/7 = 45 shares. If the stock should fail to reach that level, then on the downside, a sale of all remaining shares would be triggered if the stock should decline to 1/2 of the highest previous sale point or 1/2 of a 120% gain= 60%, or 1.60 x $7.42 = $11.87. In that case, all remaining shares would be sold. I have sometimes been questioned whether I would ever 'revisit' a stock after selling it at a loss. My current ownership of Meridian is not my first time as a stockholder. I actually first purchased VIVO 4/22/04, only to sell the stock less than a month later on 5/17/04, after incurring my 8% loss. It took me only to the following year on 4/21/05 to revisit this stock and once again add it as a holding to my portfolio. My first write up of Meridian Bioscience was on April 22, 2004, the same day as my first purchase, when the stock was trading at $11.22. Adjusted for a 3:2 stock split in September, 2005, and another 3:2 stock split on May 14, 2007, this represents a pick price of $11.22 x 2/3 x 2/3 = $4.99. With the stock closing at $20.57, this represents an appreciation of $15.58 or 312.2% since the original "pick". However, due to the stock volatility, I was shaken out the next month and had to wait a year before finding the opportunity to add the stock back into the portfolio. "Meridian did ALL of the things I like a stock to do...announced great earnings, declared an INCREASED dividend, and INCREASED guidance for the rest of the year. And NATURALLY, the stock moved up nicely today after the announcement this morning." On April 21, 2005, I "revisited" Meridian Bioscience (VIVO) when the stock was trading at $16.265. With the two stock splits first the 3:2 on 9/6/05, and the 3:2 on 5/14/07, this represented an effective pick price of $16.265 x 2/3 x 2/3 = $7.23. Again, with the stock closing at $20.57 on 5/18/07, this represents an appreciation of $13.34 or 184.5% since posting. "...an integrated life science company, engages in the development, manufacture, sale, and distribution of diagnostic test kits primarily for respiratory, gastrointestinal, viral, and parasitic infectious diseases. 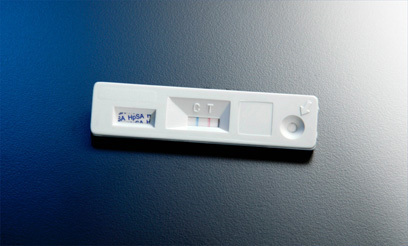 The immunodiagnostic technologies used in its diagnostic test kits include enzyme immunoassay, immunofluorescence, particle agglutination/aggregation, immunodiffusion, complement fixation, and chemical stains." On April 19, 2007, Meridian Bioscience announced 2nd quarter 2007 results. Second quarter sales came in at $32.1 million a 14% increase over prior year same period results. Net earnings for the quarter came in at $5.88 million, an increase of 25% over the same period last year. Diluted earnings per share for the quarter were $.22/share, up 22% from last year's results. The company also raised its dividend to $.16/share, representing a 39% increase at $.64/share indicated, over last year's dividends. The company also announced a 3:2 stock split in the same announcement. Strong earnings, raised dividends, and a stock split are in general a great recipe for continued strong stock price performance! Let's take another look at that Morningstar.com "5-Yr Restated" financials page! First of all we can see the steady picture of revenue growth from $59.1 million in 2002 to $108.4 million in 2006 and $112.2 million in the trailing twelve months (TTM). Earnings have been a beautiful picture of consistent growth, with $.15/share reported in 2002, $.21 in 2003, $.27 in 2004, $.35 in 2005, $.45 in 2006 and $.49/share in the TTM. Dividends have also been steadily been increasing with $.12/share in 2002, increasing to $.28/share in 2006, and $.31/share in the trailing twelve months (TTM). It is nice enough to have a dividend, something that I don't require, but find attractive, yet it is another level of performance to regularly increase that payment as well! The company has slowly increased its float with 33 million shares in 2002 increasing to 39 million in 2006 and 39 million in the TTM. This represents a slightly less than 20% dilution by increasing shares during the time that revenue nearly doubled, earnings tripled and dividends more than doubled. This is an acceptable dilution from my perspective, representing a growth in shares, something that I prefer not to see, that is far less than the growth in revenue and the growth in earnings, and even the growth in the dividend payment! Free cash flow has been positive and growing! The company reported $10 million in free cash flow in 2004, $16 million in 2005, $19 million in 2006, and $21 million in the TTM. Finally, the balance sheet is pristine with $42.3 million in cash, enough to pay off both the $18.6 million in current liabilities and the $5.2 million in long-term liabilities almost 2x over! Combining the $42.3 million in cash and the $40.6 million in other current assets yields a total current assets of $82.9 million, which when divided by the $18.6 million in current liabilities yields a current ratio of 4.46, much higher than the minimum healthy level of 1.25. This is really an incredible Morningstar.com page on this stock. And I am not just saying this because I own shares in this stock, which I do, but because of the numbers that show an incredible consistency in growth and financial strength! Reviewing the Yahoo "Key Statistics" on VIVO we can see that this stock is a small cap stock with a market capitalization of only $817.02 million. The trailing p/e is quite rich at 39.33, with a forward p/e of 29.39. The PEG (5 yr expected) is a bit better at 1.36 (acceptable imho is 1.0 to 1.5 on PEG). Using the Fidelity.com eresearch website, we find that the company has a Price/Sales (TTM) of 6.96, much lower than the average of 28.09 in its industry. As measured by Return on Equity (TTM), the company is also more profitable than its peers with a ratio of 21.71%, compared to the industry average of 16.94% according to Fidelity. Finishing up with Yahoo, we can see that there are 39.72 million shares outstanding with 32.71 million shares that float. Of these that float, there were 2.34 million shares out short as of 4/10/07, representing 6.2% of the float or 14.1 trading days of volume. This is a large number of shares sold short in anticipation of a decline in the stock price by these naysayers. With continued good news and the stock split, this represents a lot of potential buying pressure as the short-sellers get squeezed. As noted above, the company has an annual dividend of $.43/share yielding a not-insignificant 2.10%, and last split its stock just days ago, with a 3:2 stock split on May 14, 2007. Let's take a look at a "Point & Figure" chart on VIVO from StockCharts.com. We can see how strong this chart is and how it almost appears to be reaccelerating from a consolidation period in July through August, 2006. Well, needless to say, I own this stock, so please take that into consideration. However, the company is rather phenomenal for its consistency in delivering revenue growth, earnings growth, dividend growth, minimally increasing the stock float, increasing free cash flow and having a solid balance sheet. On the downside the stock is richly valued and shouldn't experience any mis-step or it is likely to be punished with a stock correction. However, if the company continues to generate good news, the abundance of short-sellers on this stock may well drive the stock higher as well. Finally the chart looks fine. I like this stock a lot. But you knew that already didn't you? Have a great weekend! Thanks again for visiting my blog and be sure and leave a comment if you have any. You can drop me a line at bobsadviceforstocks@lycos.com if you get a chance or listen to my podcast at Stock Picks Bob's Advice Podcast Website if you are so motivated! Regards to all of you! There is nothing magical about my process of picking stocks. I do believe that among my picks may be found some of the top performing stocks of the future. That, at least, is my hope. However, in order to identify these stocks it is necessary to recognize mistakes in investing quickly, and thus I suggest that losses are kept to a minimum by selling stocks that perform poorly, and that gaining stocks are maintained and yet their gains are essentially hedged against changing fortunes by small sales at appreciation targets. Again, this is my strategy. Time will tell if it is successful. As I have written previously, I have been trying each weekend to go back a little more than a year and review the entire week's stock picks to see how they would have turned out if indeed if they were purchased. This evaluation assumes a 'buy and hold' strategy, with equal dollars invested in each of the stocks discussed that particular week. In practice, I advocate and employ a very different strategy of disciplined portfolio management that requires me to sell stocks if they should incur small 8% losses, and also to sell portions of stocks as they appreciate. This different approach would certainly result in a very different performance experience in holding all of these stocks. On December 27, 2005, I posted Reliv International (RELV) on Stock Picks Bob's Advice at a price of $15.29. Reliv closed at $9.79 on May 18, 2007, for a loss of $(5.50) or (36.0)% since posting. I do not own any shares nor do I have any options on this stock. On May 2, 2007, Reliv Intl (RELV) announced 1st quarter 2007 results. Net sales increased 12.1% to $35.0 million from $31.2 million last year. Net income was $2.6 million, up 6.9% over last year's results. Diluted earnings per share increased from $.15/share a year ago to $.16/share this year. So how did I do during that Christmas week in 2005? Well not exactly glowing. With only one stock picked that week, the average performance was the performance of that only selection which unfortunately recorded a (36.0)% loss. This once again demonstrates the need to manage one's holdings closely regardless of one's belief about the prospects of any particular stock! Thanks so much for stopping by and visiting! If you have any comments or questions, please feel free to leave them on the blog or email me at bobsadviceforstocks@lycos.com. If you get a chance, be sure and visit my Stock Picks Podcast Website, where you can listen to me discuss many of the same stocks I write about here on this website. A Reader Writes "Isn't it a better buy at a lower price?" I received a terrific comment from a new reader of mine, Mel F. who wrote about my sale of my position in Immucor (BLUD). "I don't doubt that you have a system that works for you, and that you have success sticking to it. But when a stock that seemed good at one price drops, and there is no change in the fundamentals, isn't it a better buy at the lower price? I am always asking of my stocks, would I buy them today at the current price? When the answer is no, it is time to sell. I just bought a small position in Brazil Fast Food( BOBS.ob). They run burger joints in Brazil called Bob's Burgers, of all things, and just entered into an agreement with Yum brands to franchise KFC in Brazil. $43 million capitalization, and definitely under the Morningstar radar. If nothing else, their annual meeting will give me an excuse to visit Rio." You make some interesting points. There are two basic forces that will affect stock prices. One is the underlying fundamentals of which you speak. This is likely the strongest factor in price movement. And you are correct, if the stock was great at $10, why wouldn't it be better at $9? And why shouldn't you keep buying additional shares as the stock drops? Sounds reasonable to me. The second great influence on price movement is the market itself. In other words, how do we react to market movements, or should we?, and how do we know which way the market is moving in the future? Thirdly, there certainly are just plain old volatility issues. That no stock moves in a straight line, and it shall be subject to the whims of investors, and why therefore, should I ever sell a stock that I "like" just because it hits an arbitrary sell point? I think that your first supposition is mostly correct. In general I like ALL of the stocks that I purchase. In fact there are many MORE stocks that I don't purchase that I like as well. I have chosen to manage my portfolio in a very rigid, you could even say 'unthinking' fashion. Since I like all of them :), I am trying to use my disciplined approach to continually limit my losses by aggressively selling stocks that decline, regardless of my level of affection or belief in their prospects, and selling my appreciating stocks very slowly and in a partial fashion. It is this bias in my approach that I believe will lead to a profitable strategy. Your approach may well be even better. I will grant you that. But I have suffered from lack of discipline in the past. I didn't have a good strategy to deal with anything and shot from the hip as you might say. Currently, I work extremely hard to "pick" stocks with the highest possible criteria. As you say, I am stuck to the Morningstar screen and I am sure I will miss many of the great opportunities like you suggested in your Brazilian restaurant operation starting to work with Yum. That one sounds terrific. I just want to find something that works. And maybe works a bit more than the market. Thanks so much for writing. You have made some excellent comments on the blog and I look forward to your visits and participation here. This is certainly an excellent question. I suppose that a true 'value' investor, would indeed find an investment that they bought at one price an even better buy at a lower price. Since I really do have some 'momentum' qualities to my strategy, I am concerned about buying a "falling knife" as it is sometimes referred to in the 'trade', that is a stock that has a falling price may not be as good a deal as you might suspect. Immucor certainly doesn't have these characteristics and I still like the company. I am trying extremely hard to divorce myself of any emotional ties to any of my selections. I am trying very hard to sit back and in an extremely disciplined fashion sell stocks that are doing poorly---strictly price-wise---and hang on to the other stocks that are doing well---price-wise---and just sell small portions of them as they climb---all in a disciplined fashion. I am not looking for the home runs. Although I hit a few out of the park :). I try to get base hits over and over again so that I can win the game. And I am winning. So while what you say makes perfect sense, I no longer subscribe to that desire to find the incredible company that is going to the moon. I want to own a strong portfolio of companies that each have the possibility of reaching 'outer space' and yet I am fully aware of each of their risks. That is why I own a portfolio of up to 20 stocks and not just plopping all of my money on 'red' as in roulette. I don't know if I have adequately answered your question. I think so. I wish you good luck on your Brazilian investment. Sounds great. Maybe it will one day come across my screen as well and I shall find myself writing it up wishing I had bought when you mentioned it :). I apologize for not reviewing very many stocks the past week. I have been busy with things at work and at home and wanted to step back a bit for a short time from active posting. However, I shall continue to keep you posted on activity in my Trading Account and shall try to get some new ideas up on this website soon. Earlier today I noticed that my Immucor (BLUD) stock had passed my 8% loss tolerance and I sold out my position of 180 shares at $31.04. I had purchased these shares just last month on April 5, 2007, at a price of $33.86. Thus, this represented a loss of $(2.82)/share or (8.3)% since purchase. My trading rules require me to sell any position, regardless of my own affection for the stock :), or belief in its long-term viability and prospects, if it hits that 8% loss level, and out it went. Since this is a sale on "bad news", this doesn't give me permission to replace the stock. Thus, I am back down to 19 positions. However, my Meridian Bioscience (VIVO) isn't too far from a sale at a gain (? ), time will tell on that one, and if so, I shall be able to buy a new position. But this will again require that one of my remaining 19 positions hits an appreciation target. Anyhow, I am glad to be blogging this morning, at least for this post. Hang in there, I shall be back actively blogging shortly! Thank you so much for visiting and participating in this website. If you have any comments or questions, please feel free to leave them on the blog or email me at bobsadviceforstocks@lycos.com. As part of my blogging, I have been trying on most weekends to spend some time examining past stock selections to see how they turned out. This evaluation depends on an assumed "by and hold" strategy which assumes simply purchasing equal dollar amounts of each stock picked and then holding it indefinitely. However, in practice, I recommend and utilize a disciplined portfolio management system that would of course affect the performance not necessarily in a negative fashion. This system requires me to sell my losing stocks quickly and completely and sell my appreciating stocks partially and slowly at targeted appreciation levels. The difference in the two strategies should also be considered when reading the review each weekend. On December 21, 2005, I made the only selection of the week, picking Western Digital (WDC) for Stock Picks Bob's Advice at a price of $18.43. WDC closed at $18.40, down $(.03) since the original post representing a loss of (.2)% since posting. I do not own any shares nor do I have any options on this stock. On April 26, 2007, Western Digital (WDC) reported 3rd quarter 2007 results. For the quarter ended March 30, 2007, revenue came in at $1.4 billion, a 25% increase in revenue from the prior year which was $1.1 billion. Net income for the quarter was $121 million, or $.53/share, up from $102 million or $.45/share last year. The company beat expectations of $.47/share according to Reuters Estimates. So how did I do during that week in December, 2005? Well, I picked a single stock which was only fractionally lower since. No other stock picks were selected so it really was a wash. Thanks so much for stopping by and visiting! If you have any comments or questions, please feel free to leave them on the blog or email me at bobsadviceforstocks@lycos.com. If you get a chance, be sure and visit my Stock Picks Podcast Website. A Reader Writes "What three stocks....?" Hello Friends! Thanks so much for stopping by and visiting my blog, Stock Picks Bob's Advice! As always, please remember that I am an amateur investor, so please remember to consult with your professional investment adviser prior to making any investment decisions based on information on this website. "Hey, I'm 16 years old and starting stocks for the first time in my life. I come to you because from what I looked at was the most fan friendly site to read. I'm currently in a business class, so I'm not totally unaware of everything. I'm kinda looking to get started however. If you were to predict ahead: What three stocks do you think have the best chance of soaring upwards. Obviously this can be a total hit and miss science. I"m just looking to get started and do some research. I've also been interested in ROY: International Royalty. They seem to me like they are on the verge of breaking out. What do you think? Pat, thanks so much for writing. You have asked me the one thing I really try very hard at avoiding...giving specific investment advice to specific investors about specific stocks :). I know it is a bit trite now, but that is exactly what I want you t get from reading my blog. Not the individual stocks that as I like to say will go stale as fast as a dozen bagels sitting on the kitchen table, but rather the process of selecting stocks and starting to learn how to manage your own portfolio. If you can get this, even if it is very different from my own peculiar techniques, then you will have something that indeed will 'feed you' for your lifetime. That being said, I would encourage you to read through my blog. There are literally hundreds of stocks discussed and from there see if there are any that strike your fancy. Be sure and take a look at the latest quarter, an updated Morningstar exam, and look at the chart and see if intuitively the stock chart is intact. If so, you may have a great stock on your hands. You asked about ROY. Let me take a quick look at this stock that I am not at all familiar with and see if I can get a feeling for it. I obviously do not own any shares nor do I have any options on ROY. As I write, ROY is trading at $7.72/share, a bit less than what I like to see for a stock. On February 22, 2007 ROY reported 4th quarter 2006 results. They also turned profitable this year coming in at $.05/share up from a loss of $(.01) last year. Unfortunately, I depend on Morningstar.com for information that I can depend on for free cash flow, balance sheet, etc. etc. etc. And ROY doesn't have any information on this. I guess they are in the Uranium business and if I had to hazard a guess, somebody like Cramer has been hollering booyahs from here to Canada about Uranium stocks. He is a smart guy and may well be right about this one. However, since you are 16 and starting out, do you really want to 'swing for the fences' on your first at bat? Isn't it wiser to buy something that makes sense, and that you can own for a long time (?) or at least demonstrates a greater level of what I would call "quality". Maybe this just shows my age, my experience, or my distrust of aggressive investing in small untested companies. But I would suggest a new investor to be more concerned about investing in a solid, high-quality, and growing business that has a record of profitability and has verifiable information. Now that's my take. I hope that isn't too much of a disappointment for you. If you were my son, those are the things I would be telling you. Do not be afraid of a stock that is priced over $10 or $20. The number of shares that you can purchase is far less important than the value of each share that you purchase. And go for base hits on your first times at bat. Don't swing for the fences. Good luck, tell me what you decide, keep on visiting, don't get discouraged, and thank you for all of your kind words. Barnes Group (B) "Revisiting a Stock Pick"
Let me go over a few of the things that after reviewing the stock I believe that this company deserves a spot on my blog. I first wrote up Barnes Group (B) on February 16, 2006, when the stock was trading at $39.11/share. Barnes split 2:1 on June 12, 2006, making my effective pick price actually $19.56. With the stock closing today at $28.61, this represents a gain of $9.05 or 46.3% since posting a little over a year ago. 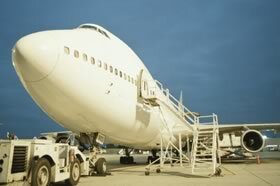 "...engages in the manufacture and distribution of aerospace and industrial products worldwide. It operates in three segments: Barnes Distribution, Associated Spring, and Barnes Aerospace." It was the announcement of 1st quarter 2007 results this morning prior to the start of trading that drove the stock higher this morning. Sales for the quarter came in at $360.7 million, up 20% from $299.9 million in the first quarter of 2006. Net income climbed 50% to $27.7 million or $.50/diluted share, compared to $18.5 million or $.36/diluted share last year. The company beat expectations of $.40/share and also raised guidance for the full fiscal year to a new range of $1.74 to $1.83/share, from the previously announced range of $1.53 to $1.60/share. It is what I call the "trifecta-plus" when a company comes in with a great earnings report that beats expectations and they go ahead and raise guidance on future earnings; the street liked the announcement and bid up the price of Barnes Group accordingly. Reviewing the Morningstar.com "5-Yr Restated" financials on B, we can see that revenue has steadily increased from $784 million in 2002 to $1.26 billion in 2006. Earnings have increased steadily, except for a slight dip between 2003 and 2004 when earnings dropped from $.66/share to $.63/share, from $.58/share in 2002 to $1.39/share in 2006. The company also pays a dividend and has raised it several times from $.40/share declared in 2002 to $.42/share in 2005 and $.49/share in 2006. The company has increased the share float from 37 million in 2002 to 51 million in 2006 and 53 million in the trailing twelve months (TTM). This 43% increase in outstanding shares was accompanied by a 79% increase in revenue and a 140% increase in earnings. So while I do believe that this share issuance was a bit dilutive, the company was able to successfully manage the new shares growing faster in both revenue and earnings than outstanding shares. The company is free cash-flow positive and growing it with $24 million in free cash in 2004, increasing to $44 million in 2005 and $73 million in 2006. The balance sheet is solid with $35.4 million in cash reported along with $425.9 million in other current assets. This total of $461.3 million in total current assets, easily covers the $295.1 million in current liabilities yielding a current ratio of 1.56. Checking Yahoo "Key Statistics" on Barnes (B), we find that the company is a mid cap stock with a market capitalization of $1.51 billion. The trailing p/e is a moderate 20.51, with an even nicer forward p/e (fye 31-Dec-08) estimated at 15.63. The PEG is a very reasonable (5 yr expected) 1.03. Using the Fidelity.com eresearch website, we can see that the Price/Sales (TTM) also suggests reasonable valuation with a ratio of 1.01 for Barnes, compared to the industry average of 1.41. However, according to Fidelity, the Return on Equity (TTM) for Barnes is a bit low at 15.25% compared to the industry average of 23.44%. Finishing up with Yahoo, we can see that there are 52.62 million shares outstanding with 40.12 million that float. Of those that float, 4.44 million were out short as of April 10, 2007, representing 9.6% of the float or 17.6 trading days of volume. This is very significant from my perspective as I use a "3 day rule" to determine significant short interest. That is if it would take more than 3 days of average volume to cover the shares already sold short by speculators, I believe the setting is ripe for a 'squeeze' of the shorts. And in this particular case, there are (as of 4/10/07) actually 17.6 trading days of volume. I suspect lots of short-sellers were scrambline to buy today as the stock had a volume of 3.7 million shares traded today, almost 9 times the average trading volume of 441,447 shares. Reviewing a "Point & Figure" Chart on Barnes Group (B) from StockCharts.com, we can see that this stock has been a bit volatile, but recently bounced off the support line at around $15.5 in July, 2006, and has since moved almost straigt higher to the current level of around $29.00. Well, needless to say, I like this stock a lot. In fact, I even owned shares for awhile, which goes to show you that I am indeed willing to re-examine past stock selections even if I end up getting stopped out and selling shares. Unfortunately, I am currently at my maximum holdings (20) because with the selling of a portion of my Precision Castparts, this would have 'entitled' me to add a new position to my holdings. But since I am at 20....well I guess I shall not be doing anything. The company reported a great quarter today. They beat expectations and raised guidance. They have been doing this steadily for the past five years and also have been increasing their dividend. They have increased the float modestly but revenue and earnings have grown quicker. Free cash flow is positive and growing and the balance sheet appears solid. Valuation-wise the p/e is moderate and the PEG is just over 1.0. The Price/Sales is nice but the Return on Equity was a bit anemic. Finally, there are LOTS of shares out short probably providing a good floor to the stock price as the short-sellers scramble to cover. Finally the chart looks nice! Thanks again for stopping by and visiting. If you would like to comment, please feel free to do so on the blog or email me at bobsadviceforstocks@lycos.com. If you get a chance, be sure and visit my Stock Picks Podcast Website. First of all, let me apologize for not getting the "Weekend Review" up this weekend. Did anyone notice? (As a blogger, especially one who doesn't require any registration for what I write, I never know if people know when I don't do something :).) Anyhow, I shall be going a bit light on the posts for the next week or two but shall try to continue to get in the "Trading Transparency" comments as they are applicable. A few moments ago I sold I sold 14 shares of my 100 shares of Precision Castparts (PCP) at a price of $112.98. These shares were originally purchased on 10/24/06 at a cost basis of $69.05. Thus these shares were sold with a gain of $43.93 or 63.6% since purchase. I had originally purchased 120 shares and sold 20 shares of PCP on 2/1/07 after it hit my 30% appreciation target. At that time, I was still selling 1/6th of positions at appreciation targets instead of my new reduced 1/7th sale strategy. In addition, if I were at my 25 position goal, this would entitle me to add a new position, giving me the proverbial "permission slip" to buy a new stock. However, since I have chosen to stick at 20 positions in light of my significant margin level, I shall be sitting on my hands and applying the proceeds of this sale to that margin balance. If you are new to my blog, you may not know about my idiosyncratic selling system. On 'good news', or appreciation targets being reached I sell 1/7th of my remaining shares in any given position. These targets are grouped by four, and then intervals are increased by 30% after four levels are reached. Let me explain again: first targeted appreciation levels that trigger a partial sale are at 30, 60, 90, and 120% appreciation levels. After that, going by 60% intervals, the targeted appreciation levels are 180, 240, 300, and 360% appreciation....then by 90%, 450, 640, 730, and 820%....etc. For Precision Castparts my next sale would either be at a 90% appreciation level, which works out to 1.90 x $69.05 = $131.20, or on the downside, if the stock should retrace to 50% of its highest targeted sale, or to a 30% appreciation level, then I would plan on unloading all remaining shares. For PCP, this would work out to a sale if the stock declined back to a 30% appreciation level or 1.30 x $69.05 = $89.77. The reason PCP jumped today, was, as you might have guessed, a great earnings report in which the company reported terrific revenue growth and beat expectations on earnings. Thank you again for stopping by and visiting! If you have any comments or questions, please feel free to leave them on the blog or email me at bobsadviceforstocks@lycos.com. If you get a chance, be sure and visit my Stock Picks Podcast Website, where I discuss many of the stocks I write about here on the blog.